ClaireFontaine PastelMat is full of surprises! A while back I received two sample products for review -- a set of Deep Darks in Pan Pastels and a little pad of ClaireFontaine PastelMat coated pastel card. This product is currently available at http://www.dakotapastels.com and that's the only place I know where you can get the PastelMat online in the USA. It's well known in Europe and recently imported through LLC Colorfin, the folks who bring us PanPastels and make me very happy with less mess and painterly results. 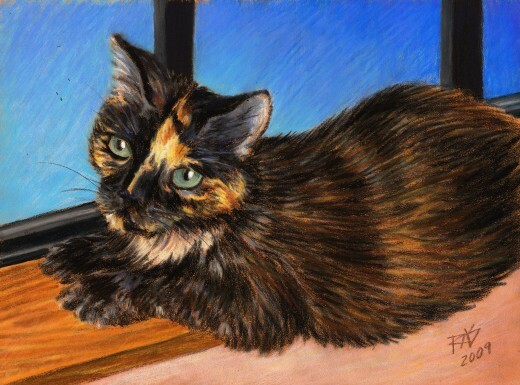 Above is my Christmas present to my daughter, a portrait of her cat Miss Gemini sitting in the window of my room. I worked from a photo reference and from the real cat moving around in sunlight to get accurate color and detail to her markings, using Cretacolor pastel pencils. I tried the pastel pencils because I found that ClaireFontaine PastelMat is the best coated surface for fine-detail realism that I've ever tried. I can get painterly results or detailed careful realism, feathered fur-texture strokes that drift off or perfect linear accents. The surface is so versatile that I love it despite its considerable cost. I hardly dared try it for the longest time. I checked the price and full sheets are $9.91 -- almost $10, lowered by about a dollar if you buy ten of them. PastelMat is also available in three pad sizes and eight colors -- White, Sienna, Brown and Anthracite are included in the sample pad I've got. Anthracite is a glittering near-black color, not charcoal but something more like black with a bright iridescent shine to it. The colors I don't have yet are Wheat, Sand, Light Gray and Dark Gray. Pads come with a heavy cardboard back and a sheet of glassine bound in over each sheet to protect your art if you use the pad like a travel journal or sketchbook. My favorite pastel surface is sanded -- Art Spectrum Colourfix paper comes in 20 colors, has primers available in all 20 colors and now they've made a set of 20 half stick pastels that exactly match the paper colors so that you can put skyholes to match the paper or otherwise make corrections or marks that flow into the background with only a texture change. I've also tried the very rough tooth Kitty Wallis papers in both Museum grade and Professional with dramatic results. I've also tried Hahnemuhle velour board and velour paper, both of which have the same literal velveteen surface. That comes in eight colors and is especially good for rendering animals, you can get very soft shading and transitions on velour paper. It's not great for hard edges or small details but I work pretty large on it and love the effects when that's what I want. Sanded papers can give a pastelist many layers to work with, holding the color hard and eliminating or reducing the need to use fixative. 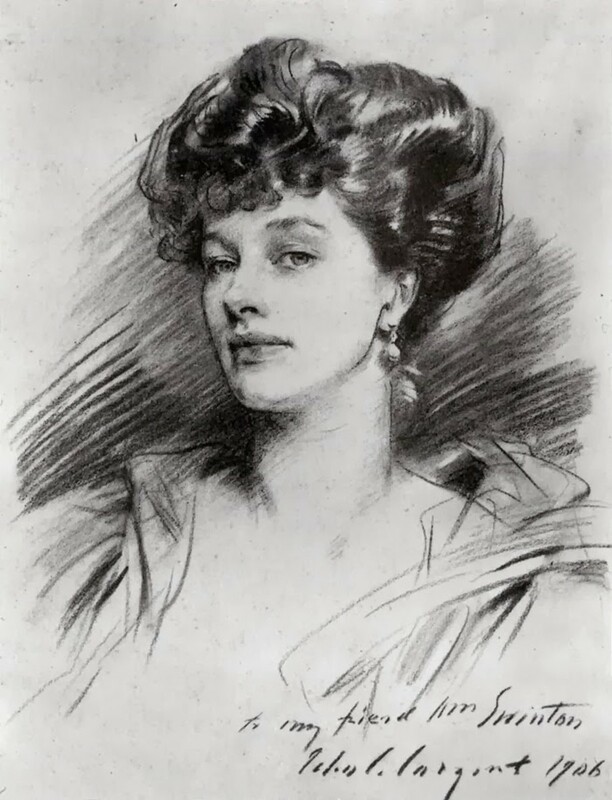 Plain pastel papers like Fabriano Tiziano, Canson Mi-Tientes or Ingres paper need fixative to restore tooth after the first two or three layers, especially if you work heavily. They're good for sketching and light drawing but don't hold the multilayered approach the way sanded papers do. An economical way to try sanded pastel paper is to practice on 800 to 400 grit sandpaper from the hardware store to get a feel for how your strokes work on the surface. Be warned though, sandpaper from hardware stores is not archival and may break down pretty fast through being acidic. Keep that for studies and practice. A better economy measure I found, since I liked the Colourfix paper so much, was to get AS Colourfix primer and use it on 140lb watercolor paper. For serious projects I prime good all-rag Arches watercolor paper and for practice paper, any student brand like Winsor & Newton Cotman paper works fine. So I thought I was pretty well set between the Wallis and Colourfix. I didn't need a new pastel surface -- after all, I don't expect to do as much detail with pastels or pastel pencils as I do with colored pencils. I got used to working looser with pastels, another benefit of sanded grounds. So when I flipped open the pretty little 7" x 9 1/2" pad with glassine between its sheets, I was surprised at the feel of it. The card seems to have a surface like a nice vellum Bristol or something like that. Very smooth, very suited to ink work or fine detail. I didn't even think it was coated, you can't tell by touching its velvety soft surface. The surprise came when I started working on it with Pan Pastels. Every rave review I read from other Pans pastelists made sense and came true. Painting with Pans on the PastelMat surface is a bit like painting on the sticky side of tape. What strokes I put down stayed put where I left them! It's easy to glaze more layers over what's down without disturbing the layers under them by using light to moderate pressure. When I wanted to mix with colors under the stroke, heavier pressure and a squidgy motion did allow some mixing -- it's versatile that way. The painting below left literally only three grains of loose dust that I knocked off over the wastebasket. Made it in one bang and all three went into the can too. I'm not kidding. Just three bright grains that happened to fall over areas of contrasting color. There was no cloud of dust at all, no big dustiness. Pans are less dusty than sticks, but still even for Pans that was an amazing result. So here's a painting done with Pan Pastels on white ClaireFontaine PastelMat. Dawn over Outcrop on Mt. Petit Jean by Robert A. Sloan, PanPastels on ClaireFontaine PastelMat, 7" x 9 1/2"
Apologies for the scan above, the sky is not that faded in the original. A scanner often drops the lightest value to white, so it took some fooling around just to make the sky colors visible. I used the round-tip small sponge for the clouds and some blocking in, then switched to the wedge sponge for most of the painting. Flicking the corners gave me those sharp-edged foliage marks and dragging the corners worked even better for details on the rock outcrop than the pointed trowel Sofft tool. 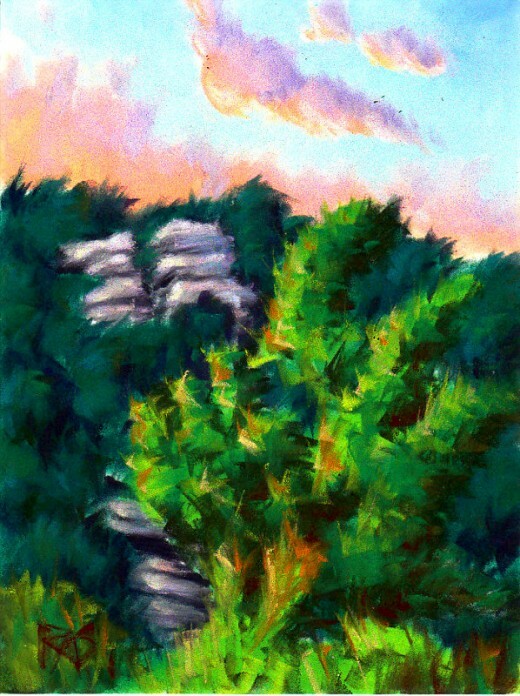 There are about fifteen or more layers on the foreground bright tree, getting the foliage masses right and building up contrasting colors in both the shadow and light areas on them. It didn't matter how many times I went into it, the PastelMat remained sticky and hung onto what I added like it was magnetic. The surface is a real fooler that way. You'd think it would only hold one or two layers like Canson Mi-Tientes smooth side, but it's got a fine-grained nap that's very soft and the pigment particles wedge themselves in firmly with every stroke. I got good coverage when I was blocking in and was able to work over even that heavy application as if I was going directly to the paper. I don't actually know how many layers this surface will take, because I haven't reached its limits. I stopped when the painting was done and looked good. 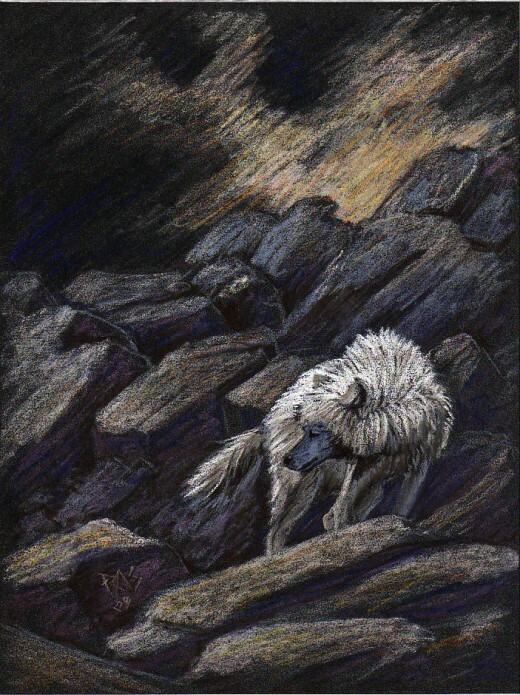 A White Wolf by Robert A. Sloan, 7" x 9 1/2" in Cretacolor pastel pencils on Anthracite color ClaireFontaine PastelMat. Above is my son in law Karl's Christmas present, a white wolf drawn more loosely on Anthracite color PastelMat. Once more the amazing detail available with this surface helped me to get the wolf's features and expression perfect. The very fine line of his mouth and the precise shape of his eye seen from the side were details I could not have accomplished at this scale on Colourfix, much as I love my Colourfix. It's very easy to get loose textural effects on PastelMat. The sparkle of the Anthracite color comes through in the rocks and sky as I deliberately spaced my hatching marks a little farther apart to use some of the background color in the looser rendered background. The scan didn't capture the subtle variations in hue on the wolf's white fur, but they're there in the original and many fur areas are layered and highlighted with white over light colors. It's not quite a deep dark black -- a black pastel or charcoal will bring the color down one firm value step to smooth matte black, so you can get one step darker for the darkest accents and still have a sense of a black painting. Anthracite makes a wonderful dark ground for anything you want to create by adding highlights. It's wonderful for night scenes, even better than a black paper. I recommend this paper without question for anything you want to do in pastels. I have yet to try loading it with multiple layers in super soft pastels like Terry Ludwig or Sennelier, but I'd be working larger if I used those anyway. At this size, I would recommend using Pan Pastels or the medium-hard range of pastels such as Color Conte, Richeson semi-hard pastels, NuPastel, Pastels Carre from Cretacolor (same as the pastel pencils) or any pastel pencils. I'm sure the super-soft pastels would add bright opaque accents and highlights to any painting, but with most surfaces they fill the tooth fast. The best surface for using the super soft pastels with is probably Kitty Wallis's product, Wallis Museum. I recommend Wallis Museum over Wallis Professional because the sandy coating is added to a heavy watercolor paper rather than card, so it's going to stand up better to wet treatments and washes -- and to washing it off if you goof up the painting. It can be more economical to spend a little more but relax and know you can redo the painting if it's messed up than to do it once and know the paper's used. Of course, PastelMat is absolutely wonderful with Pan Pastels. It sings with them. It's perfect for those thin veils of color or thick applications where you pat the sponge into the color three times for every stroke. No matter what I have used on it, PastelMat leaves little or no dust. 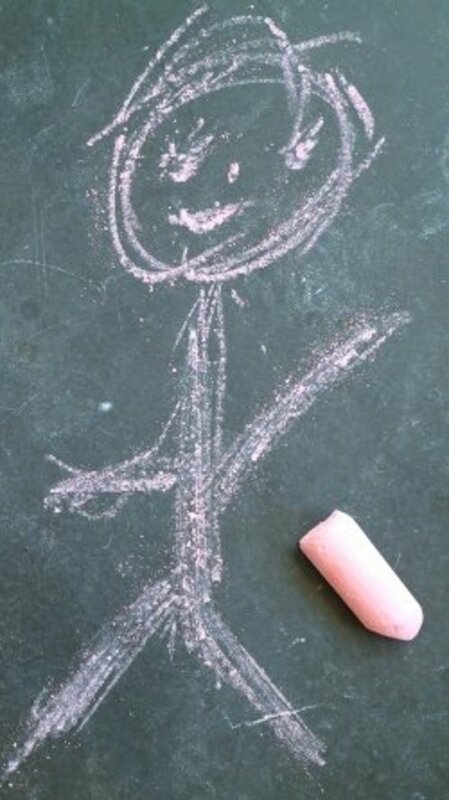 Even the pastel pencils left hardly any dust and didn't smudge. Oh, that was the best part! While I was working on the cat portrait, I had both cats run past me over the art. My cat Ari has snowshoe feet -- he's got thick white tufts of fur between his toes and when he swats or steps on a pastel painting, it's like scrubbing it with a fat soft sable brush. He didn't get any on his feet. I couldn't even see where his footprints were. The lack of smudging was amazing, this paper is so forgiving of a bump or the swish of a fluffy tail that I'm delighted. So if you use pastels and have cats, definitely consider PastelMat. It is an expensive fine art archival paper, suitable for any serious painting or for sketching if your budget can afford it -- the pads are well set up for a series of sketches with those glassine inserts. For myself, I think I'll be careful and plan what I paint on PastelMat in my sketchbook first with thumbnails and value sketches, then go to the good stuff -- or do preliminary studies looser on homemade Colourfix without as much detail. I plan on ordering all eight colors in full sheets, as that's the most economical way to purchase PastelMat. The pads have four colors with three sheets of each color, but a full sheet quartered gives you four sheets of each color and getting ten at a time in effect gives you the tenth one free. Because of the fine-detail possibilities, PastelMat may be a wonderful surface for doing ATC or ACEO cards -- cutting it down to trading card size would let you play with the surface in a lot of different ways without spending too much per painting. After trying both velour and Colourfix for pastel ATCs and ACEOs -- 2 1/2" x 3 1/2" trading card sized artworks for trade (ATC -- Artists' Trading Cards) or sale (ACEO -- Art Cards Editions & Originals), I think I'll get much better results with PastelMat being able to scale down a painting to fit in that miniature format. 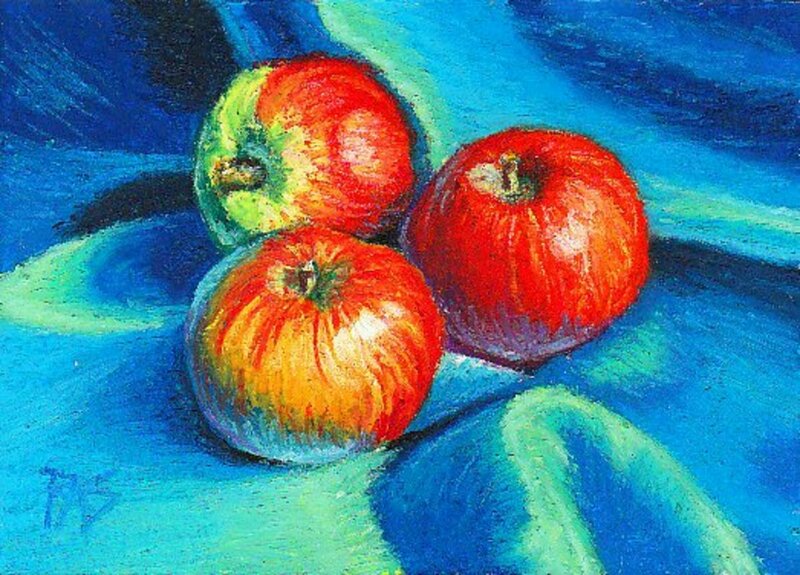 Velour ACEOs are impossible to protect from blurring in the mail, they get shaken around and lose all their details. Colourfix holds better but won't get the detail of PastelMat, while the PastelMat ones are so free from smudging that there's no risk sliding an ACEO done on one into the top loader or sending it in the mail. When I order my PastelMat sheets, I'll also pick up a can of the new SpectraFix fixative. 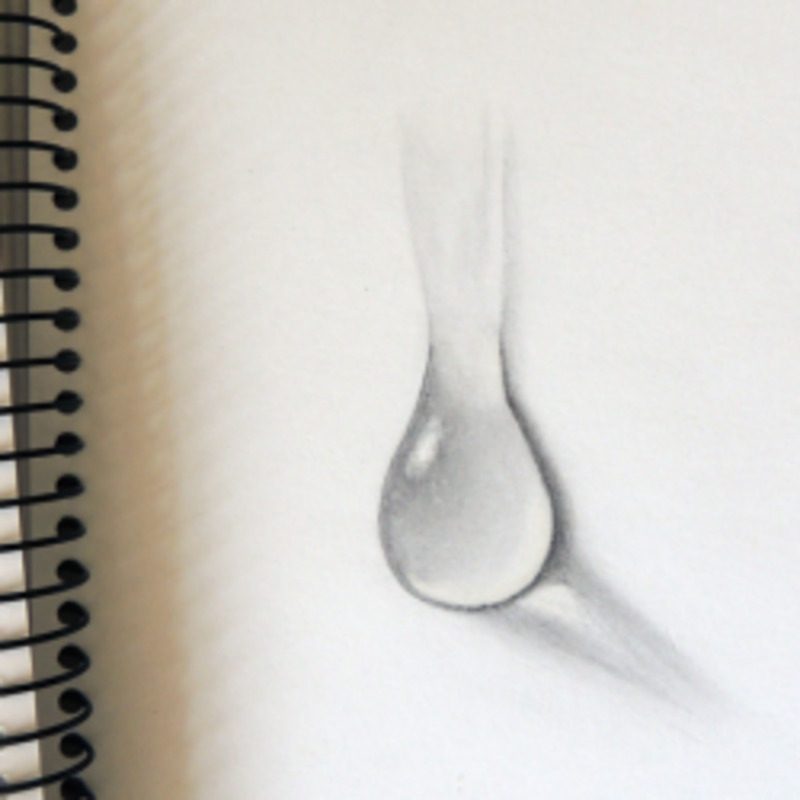 PastelMat does not need fixative at all. I am not kidding. I couldn't scrape the color off with my cat's foot, so without an eraser you're going to have no problem keeping the color on the painting and don't need to fix. However, I do like using pastels, graphite and charcoal in my sketchbook and those do need fixative to keep from smudging. SpectraFix fixative is a green product -- it's casein milk solids in a grain alcohol base, the concentrate can be reconstituted with Everclear or Vodka. The can has no propellant, it's a spray mister that doesn't add any toxic propellants to the atmosphere and it can be refilled by using the concentrate/white liquor combination. So if this works as well as Blick or Krylon, it may become my fixative of choice whenever I actually want to use fixative on something. When I use PastelMat, I don't need it at all. That's something lovely because your colors on a PastelMat painting will remain as bright and true as they are in the stick. Enjoy! Try one or both of the small pads first to see if you like it, or stock up on the big sheets to save. I love the cat portrait, which reminds me of a cat I had long ago. Great review, and TERRIFIC pictures! Thank you! Some great examples of art with pastels here, especially the opening miss gemini cat picture, the colours are intensely realistic with pastels. 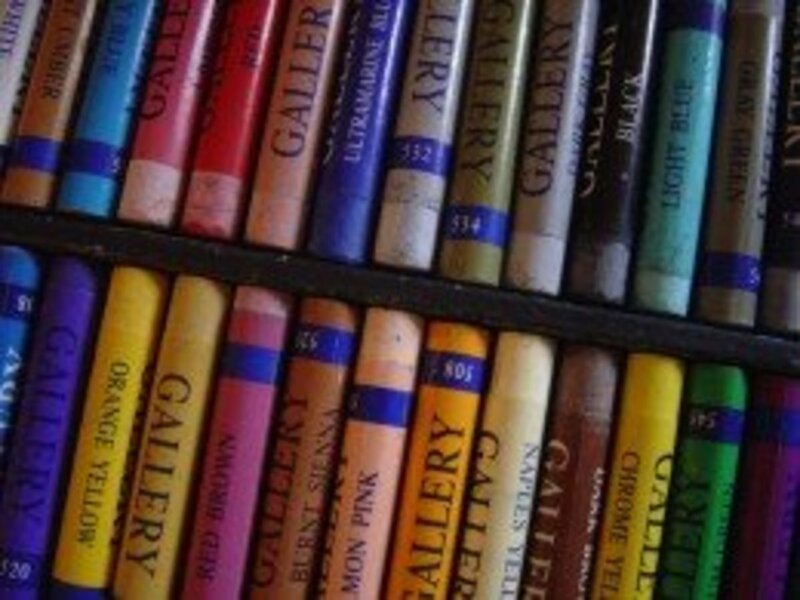 Pastels are an art medium that I do need to explore more as I am a more coloured pencils user than anything else. Very detailed review, top marks and happy new year!